Until 1950, most of the fish extracted from the waters of the Humboldt Current along the western coast of South America was destined for consumption. Artisanal fishermen provided the local markets with mostly neritic fish, since transportation from the fishing ports to centers of consumption was very limited. Still, some canning plants were scattered along the Peruvian and northern Chilean littoral, specializing mostly in tuna, bonito, and sardines for domestic consumption. In 1950 the volume of fish captured by Peru and Chile was 86,723 and 73,500 mt, respectively. Hake accounted for 38 percent of the Chilean captures, while herring made up 13 percent of the Peruvian landings. When the first fish-meal processing plants opened on the coast of central Peru, in 1953, landings rose to 111,700 mt, with anchovies accounting for 40 percent of all captures. That same year, Peruvian captures surpassed those of Chile by 4,900 mt. By 1962 Peru had become the number one fishing nation in the world (by volume, not value, of landings). The impressive growth of Peruvian industrial fisheries was made possible by the major concentration on anchovy (Engraulis ringens), which constituted 90 to 98 percent of all Peruvian commercial landings between 1957 and 1976 (Fig. 15.3). The concentration of fishing effort on this species can be best understood if one considers that from 1958 to 1959, as speculative growth boosted the installation of fish-meal plants along the coast of Peru, anchovy landings more than doubled. In addition, from 1959 to 1971, the yearly increases varied between 15 and 25 percent. Only in 1965 and 1969, when relatively minor El Nino episodes occurred, did the catches drop below those of the previous year. Fig. 15.3 Development of Peruvian fisheries, 1950-87. The uncontrolled fashion in which anchovy were extracted from Peruvian waters and the contractions of the standing stocks observed in 1965 and 1969 worried international fishing authorities and conservationists. At a meeting held in Lima in 1970, a panel of experts (Instituto del Mar del Perú, 1981) critically reviewed the situation created by the frantic multiplication of fishing plants and the high volume of anchovy extraction. The panel issued a warning that, if the harvest remained above the maximum sustainable yield (MSY) of 9.5 million mt a year - including nearly 2 million mt estimated to be consumed annually by seabirds -the anchovy fishery would risk a collapse similar to those of the Sakhalin and the California sardine fisheries. These warnings were heeded neither by the fishing industry, which was fast amassing big fortunes, nor by a government that enjoyed the tax revenues and foreign exchange generated from the rising exports. 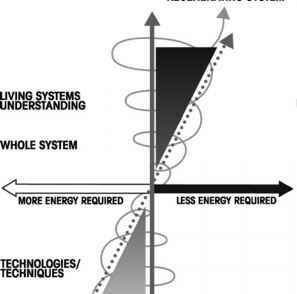 Moreover, the warnings about resource depletion were also ignored for fear of reducing employment opportunities in coastal communities that had been flourishing since 1955. The extraction of anchovy continued to increase reaching 12.4 and 10.5 million mt in 1970 and 1971, respectively. Under these societal circumstances, a major El Niño developed in 1972. Although relatively mild when compared to the global effects of the 1982-83 El Niño, the impact of the 1972-73 El Niño was devastating and long-lasting (e.g., Hammergren, 1981). In 1973, total landings dropped to 2.29 million mt. It was not until 1984 that the volume of fish landings rose above 4 million mt. The regeneration of the anchovy stock in Peruvian fishing waters has proven a painfully slow process, despite hopes and expectations to the contrary. In Chile, the story of industrial fisheries growth has been shorter and different. The expansion from artisanal to industrial fisheries was restricted to the northern Chilean littoral, where a few fish-meal plants were established in Arica (Fig. 15.4), Iquique, To-copilla, and Antofagasta (Salinas, 1973), in contrast to over 16 Peruvian localities with industrial processing plants, during the halcyon days of the Peruvian fishery. The increase in Chilean landings was never spectacular and reflected the contractions associated with El Niño occurrences as well as the severe fishing restrictions such as closed seasons (vedas) imposed by the administrations of Presidents Frei and Allende. Restrictions were imposed whenever fishing officials noticed declines in the reproduction of certain species. The 1972-73 El Niño did not spare Chile; the total level of landings, which in the 1960s hovered around 1.2 million mt, stayed below one million from 1972 through 1975 (Fig. 15.5). Fig. 15.5 Development of Chilean fisheries, 1950-88. 95 percent of the total catch. When the 1972 73 El Niño struck, the Chilean fisheries industry adapted to the conditions and restructured itself around an alternative fish supply that Peru had not exploited jack mackerel (Trachurus murphyi). Of secondary value to consumers, this fish had been overlooked by industrialists. It proved, however, to be a valuable resource for northern Chilean fisheries. 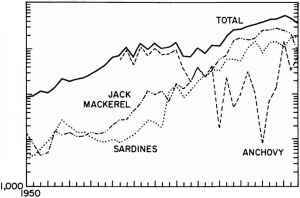 In 1976-77, when anchovy fishing was discontinued to let the dwindling stock recover from the effects of overfishing, the jack mackerel resource was available to replace anchovies (Caviedes, 1981). 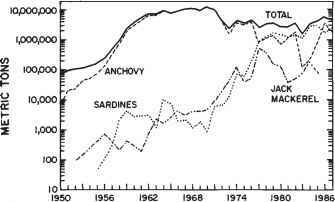 This development in Chilean fisheries was accompanied by a secondary emphasis on sardines (Sardinops sagax), the capture of which had been steadily increasing since 1977. By 1988, sardine had become the most exploited species, accounting for 48 percent of Chile's total landings.